From the choreographer’s point of view, human existence is like a particle being blown into this enormous space called Earth – a tiny atom forced to find its way in the endless Universe. As humans, we design our lives in transactions through cultural, artificial, social, familial, instinctual, animalistic exchanges. These constant variables give us a sense of meaning … or confusion. 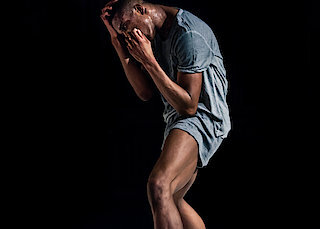 With technical virtuosity, choreographer Roderick George combines the aggression and urban essence of hip hop with the courtly rituals and strict body lines of ballet.